In Ep. 19 of Living With Money, Tim talks with Conor Richardson. 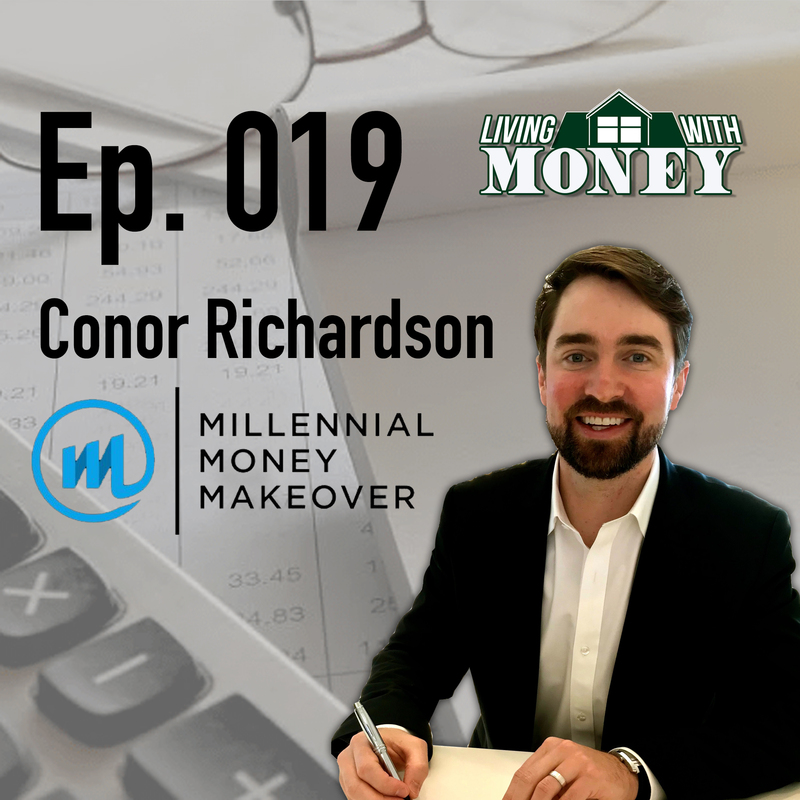 Conor is a CPA, author and blogger at Millennial Money Makeover. Conor and Tim discussed all things personal finance when it comes to millennials. Tim asked Conor why he decided to target his writing specifically to millennials, and what he feels is the most important thing missing from a millennial’s financial education today. They talked about why millennials control the future of money, and how to find that important balance between wanting to live your life now, versus saving for retirement later. They also preview Conor’s upcoming book called Millennial Money Makeover, due out in the beginning of 2019, and much more. Tim Mullooly: Welcome back to Living With Money, this is Tim Mullooly. On today’s episode, I am joined by Conor Richardson. Conor Richardson is a Certified Public Accountant, and also runs a website called LaunchYourFinances.com. And is the author of the upcoming book Millennial Money Makeover, which we will discuss later on in this episode, and comes out at the beginning of 2019. So Conor, thanks for coming on the podcast. I appreciate you taking the time. Conor Richardson: Absolutely, Tim. Thank you very much for having me. I’m thrilled to be here. Tim Mullooly: So for our listeners, can you give them a brief background on yourself? You know, have you always been interested in finance? What was your journey in life like up until this point? Conor Richardson: So I think my interest in Finance and Business started at the same time, relatively early in life. When I was young I was always setting up the traditional businesses, mowing lawns in the neighborhood and things like that. And then a little later in life when I was in high school, I really got interested in writing. And when I went to college, I went to the University of Georgia. I thought I was going to be a journalism major. But I took this roundabout approach to eventually land in Accounting and Finance. I actually started off as a Biology major, and then went to Psychology. And then eventually landed in Finance and Accounting. From there, my interest in Business took off, and I went to Villanova University to earn a master’s in Accounting and Professional Consultancy, which was an absolutely tremendous experience for me. It was a really small program, and so there was a lot of one-on-one interaction with the professors. It was tremendous in terms of learning how to analyze from a high level, and really dive deep and learning the nuances of different approaches to business. And so that really jump started my interest in wanting to go to New York City, which is as you know, essentially Finance mecca. And I started my career with Deloitte and Touche, which is a large public accounting firm in New York. And then eventually went to work for Tough Mudder and their Finance department. And then my interest in personal finance really shot off from there, and it was my own personal journey that really led me to start researching, and writing a lot about personal finance in general. Tim Mullooly: That’s awesome. So through school you touched on a number of different topics there. I feel like all that help within Finance, you know Psychology, definitely plays a big part in Finance that sometimes people don’t anticipate. And then Accounting as well. You can see how people use their money and how they could better allocate their finances. Do you find that having a little bit of background in all of those areas has helped you in your writing about personal finance? Conor Richardson: Absolutely. I mean I think having a blended background is quite essential for writing well, in terms of personal finance. So having the business background allows you to think critically. And then having the CPA credential, which is a lot of work and a lot of effort, really cements the foundation upon which you can make educated business decisions as well as understanding the best approach to personal finances in general. Tim Mullooly: You know, there are so many different topics within Finance. Why did you feel that writing about personal finance was the right choice for your writing? Conor Richardson: I think it was in an organic path for me. In college, I was really interested in writing like I mentioned. And so I toyed with it a little bit. At the University of Georgia there’s a college newspaper called The Red and Black, and so I did a couple different articles for them. Was really interested in the storytelling, and getting people’s story out into the world. And then from college I really started my focus on Business when I went to my master’s, and then started working in the professional world. And so I think coming back to write towards personal finance has just been a large circle for me, in a sense. It just seemed to make the most sense for me in general, and has been a thrill to do. Tim Mullooly: So many people out there just need help with their finances. So I feel like writing about personal finance is definitely a topic that there’s a need for. And a lot of your writing is geared mostly towards millennials. What made you target that group of people, millennials in particular? Conor Richardson: Well that’s a great question. I am my brand, so I am a millennial. I’ve faced and I’ve seen all the different challenges that my generation faces. So just to give the listeners some context, millennials are basically anyone born between the early 1980s and the late 1990s. So there are about 75 million millennials in the U.S. And unfortunately, half of them, over half of them actually are stressed about money. I really wanted to help really a generation of people work through the same problems that I was working through. And moving from New York, I actually live in Austin, Texas now, so in that journey, I kind of had my own personal finance sojourn as well. And I was writing about what I was learning, and really refining a skillset and taking everything that I read through books, and the internet, and trying to distill it down into the actionable and meaningful things in life. You know, I thought to myself while I was doing this, if I have an education in Accounting, I have a CPA, and I find this incredibly difficult to do, how the hell is everyone else doing this? Conor Richardson: And in the end, it just felt not necessarily a choice, but rather it was a necessity to get a clear voice out into the world that’s just … There’s a cacophony of different voices going on. So a clear singular message is what I needed, and it’s what my readers love as well. Tim Mullooly: Being a millennial as well, I agree with everything that you’re saying. Working in Finance, I hear all the time from my friends, “We didn’t learn about any of this stuff in school. Help me”. Try and just guide them on the path to making what to us, might seem basic decisions, but for people not in the Finance or Accounting industry, they really have no sense of direction. So with that, these things aren’t really taught in standard education. What would you say is probably the biggest thing that young people are missing in their personal finance education? Conor Richardson: Well, Tim, that’s a terrific question. And I think it requires a two-pronged approached. So one is flying high. And the other is doing a deep dive into the granular. So I think the biggest thing that young people are missing in their education is being educated about the real world impact of taking out large student loans, and student loans in general. Forty-four million Americans hold a collective outstanding debt of 1.5 trillion dollars in student loans. Okay, that’s non billions, that’s trillions. And that’s a massive number. Seventy percent of college graduates hold a significant debt. Well what does that mean? That basically means a prohibitive debt. Young people don’t quite understand how … I say young people, I basically just mean my peers. It’s making the decision before you sign the papers. What does $40,000 or $80,000 in debt really mean? Well it’s really hard to have a proxy of comparison at that point because you’ve never earned a large salary before. So you don’t really quite know the real world impact. So I think on a high level, it’s absolutely student loans. And then to dive a little bit more into the weeds, it affects people on a daily basis. You might have $500 or $600 going towards an interest payment or a principal payment on student loans, and it affects your ability to start saving, to save for a down payment on a house, to buy a car, you know all these real world impacts. And so I always tell people, when they’re thinking about going to college, or graduate school for those millennials who are a little bit older, it’s to really take a moment and don’t get distracted by prestigious names, but calculate the total cost of education, of where you want to go. And think about the long term economic outcomes of where you’re going to go to school, the degree you’re pursuing. When you’re choosing what you want to do, focus on the fact that majors matter. It’s fine to be a Philosophy major or an Art major, but maybe think about combining that with Economics, or Finance, or Accounting. Something that’s going to give you a larger return on your investment immediately after you get out of school. Tim Mullooly: Right. Would you say something maybe along the lines of … because I agree with everything that you just said. These students are supposed to make these big decisions on large amounts of money for loans, like you said, with no real way to compare it because they haven’t earned really any money. Would you say that having some sort of class in high school right before they go to college to educate them on potential results of their decision would be something that they could benefit from? Conor Richardson: Yes, absolutely. I mean I think money in this country is taboo. And because it’s taboo, we don’t talk about it. And by definition, that creates a sort of catch-22 around it, period. And so I think having those conversations about money when you’re in high school is incredibly important. Relaying to students, or soon to be college students or graduate students that you really need to think about this, and not just the prestige or the name of the institution. Because at that point, you’ve worked so hard to go along with this success sequence which is you study hard, you get good grades, you get into the best college you can, and the best college you can get into it might not make the most economic sense for you. So just having the conversation is incredibly empowering onto itself. Tim Mullooly: Right. You know, just sitting down and doing the simple math is often times part of the process that gets skipped, because like you’re saying, it’s a taboo topic. So not many people like to talk about it. But in reality it might take you 10, 15 minutes with some simple math just to figure out if it makes economic sense or not. Conor Richardson: Right. So you have to work 10 years at your high school job to pay for the first year of college. Being able to relate it back to something that is comparable is paramount to understanding it. Tim Mullooly: Moving forward, hopefully a class like that is one day introduced to high school students. But as of right now, nothing like that exists. So in a world where a lot of students are coming out of school now with some serious debt, what would you say to them as being the first step towards digging themselves out of debt? Conor Richardson: Everything in life, and especially in personal finance starts with the decision. They need to make the decision. You’ll get to a point where you get tired of putting it off, and when you get to that point, you need to make a decision, you want to get debt free, and eliminate your student loans. I think one of the largest mistakes people make is thinking that because student loans are generally long term in nature, their maturity is 10 years or more, that that means long term payments are okay as well. But the reality is, if you make the decision to get rid of your debt, it’s going to free you up to do everything that you want later in life. And then you can maybe decide I want to be more aggressive because I want to be debt free in one, or two, or three years, versus waiting 10 or 20. Tim Mullooly: Right. A lot of people don’t realize that those payments that they suggest to you are the minimum payments. So you can always, if you can afford it, like you’re saying, check out your finances. If you can afford it, pay that off quicker, you can get yourself out of debt faster than anticipated. Conor Richardson: Right. And the average debt load for a recent college graduate in 2017 is around $38,000. So that’s an exceptional amount of debt and it requires and exceptional response. And I think not many people say that out loud enough, and it needs to be said. Tim Mullooly: Yeah, I totally agree with that. Seguing into that, we have so many millennials with a lot of debt but this generation really is the future of people. So in a recent blog post you wrote about five reasons why millennials control the future of money. Do you want to briefly talk about those points and what you meant by that? Conor Richardson: So that was a very fun article to write. As you mentioned the article basically addresses how we view money now, and how that’s going to shift in the next 10, 20 or 30 years. In the article I address really five key main points. And the first is that millennials are about to receive a massive transfer of wealth. So over the next three decades, millennials are going to be given by inheritance, gifts, or other means about 17 trillion dollars will flow to millennials to manage. And that’s largely because one of the richest generations, the baby boomers, will be transferring that to their children. So millennials are about to receive this massive inheritance, and they need to understand how they’re going to manage it, and they need to be thinking about that now to do it well. The second point was that millennials are digital natives. Now you know this, I know this, we’re using a podcast right now. Ninety percent of millennials check their phone within the first 15 minutes of waking up. And so, money is trending towards that digital element. And the third point was that we’re comfortable sharing data. Millennials are comfortable sharing data if it gives them an edge, if it makes life easier. You have all these different budgeting and financial planning software that it takes all of your banking account information, your personal information, but at the end of the day it makes your life easier. It analyzes what you spend. And so millennials are absolutely okay with that. I think one of the great things is the fourth point I make, is millennials are going to use capital for social good, which is tremendous. So there’s going to be a boom in philanthropy. A kind of caveat to this is that because we are going to give capital for social good that will actually make us feel richer. So in a book called Happy Money by Elizabeth Dunn and Michael Norton, one of the things that they point out is if you spend your money and invest in others, it actually makes you feel richer and lead a fuller life. And so the fifth point was that there’s going to be a new wave of money management into the robo advising, or the hybrid investment, and robo advising platforms, because of all the points I mentioned previously which is millennials are very technologically savvy, they’re comfortable with sharing data, and so they’re fine with a more algorithmic approach to optimizing their portfolio. Tim Mullooly: Yeah. I totally agree with that. Especially that last point about robo advisors. Us, here, being investment advisors, we’ve seen firms starting to pair up with different robo advisors and combine the human element with that advance in technology of the robo advisors. So I definitely agree with what you’re saying about that. You know, with all this technology that we have available, it makes goal setting a little bit easier to really map out what people have and where they can realistically get to over their course of their career. So how important do you think that setting realistic goals is when dealing with finances? And can you speak a little bit to the need to have the right intent in mind when dealing with finances or starting a project? Conor Richardson: Setting goals is instrumental. As humans we have the frontal cortex, and that allows us to basically look into the future. And it makes our minds uniquely human in the fact that we can look into the future, and we see the need to plan, and save for retirement, and we can strategize about where we want to go. I always tell people set large goals for yourself, because if you set large goals for yourself, and you fall a little bit short, you’re going to be way far ahead than where you were if you set small goals. I think having the right intent means, so if you’re going to set large goals, then you have to have the intent to do all of the different things to bridge you to your goal. To get from A to B, what are all the different small tasks that I need to do to maybe change daily habits, or set up a structure in my daily life that will ultimately let me get there. In personal finance, you actually don’t need to change that much to produce tremendous rewards. So if you save … So the max for a 401k contribution $18,500. If you invest that into the S&P 500 over the next 30 years, you will end up with a retirement account into the 3-4 millions. And that’s only putting around $18,000 away a year. So that is a lot of money for a lot of people, but it’s not not-doable. So picking out the small wins to get you to the large reward is absolutely critical. Tim Mullooly: Right. Compound interest and just the ability to put little chunks away over time really can add up over the years. And it’s important that people understand that no amount is too small, and it’s always about setting the right goals and having that right intent in mind. One thing that I do hear though, a little bit of not necessarily push back, but just a rebuttal to the start saving for retirement that a lot of advisors and finance professionals say, I hear millennials say, “Well you know, I want to enjoy my life right now, versus saving, putting all that money away for retirement.” What kind of balance do you think is best or optimal for a millennial trying to deal with paying for things right now, and enjoying life right now, versus saving for their retirement later on in life? Conor Richardson: That’s a nuanced question, and I think it really starts with ultimately retirement is this blissful, sort of end of later stage in life where we’re sitting and doing the things we want to do, and not working. But millennials actually have a different view of retirement altogether. So they don’t want to retire and sit at home, and do nothing. They want to be proactive, and they want to retire early. I think the average age is around 57 years old, is where millennials are targeting for retirement. And they want to continue consulting, and writing, and doing active things in their life. And so I think if they want to pull forward, so to speak, some of the retirement advantages, which is maybe working a little less, having a more flexible job now, you can do that. You just have to be very realistic with what that means in the long term. But I think what’s critical is that when you’re building a budget, put in some line items there for fun money, for things that you want to do. So if you want to travel more, and that frees you up and that’s what you associate with retirement anyways, then build up a savings account where you’re going to save a couple hundred dollars a month. And then eventually take a long term trip to Bali, or wherever else you want to go. You can live that retirement experience. It just doesn’t have to consume you wholly right now. Tim Mullooly: Right. As long as they set the right goals and they have the realistic what they want in life, and they put that structure in place early, whether it’s have the traditional retirement later on in life, or be able to enjoy traveling while you’re young, and working a little longer, whatever it is, as long as it’s in place early and realistic, and they stick to it, I think either way is a good way to go. Conor Richardson: Absolutely. Personal finance is just that. It’s very personal. So you have to sit down and map out exactly what you want out of life, and then build a budget that fits with that. Tim Mullooly: Exactly. So you’ve recently launched a new website. Do you want to tell the listeners about that, and what they can expect to find over on that website? Conor Richardson: Sure. So I used to do the bulk of my writing at launchyourfinances.com. And I have recently launched millennialmoneymakeover.com. And I’m really excited about my new website. It’s been live for a couple weeks now. We had a lot of traffic at Launch Your Finances, and so I kind of need a new, more robust platform, which is what Millennial Money Makeover gives me. We talk about all things money and millennials. So we talk about credit cards, student loans, checking and saving accounts, how much to save for retirement, and the concept of what I call living the rich life. We also talk about that a lot as well. So if you haven’t checked it out, come on over. And definitely say hi. Tim Mullooly: That sounds awesome. And for anyone listening out there, we’re going to link in the show notes, we’ll have a link to millennialmoneymakeover.com. Be sure to stop over there and check out the website. Also, Conor has a book coming out also called Millennial Money Makeover. That should be coming out on Amazon, listed as January 1st of 2019. It’s available for pre-order now. So be sure to go pre-order a copy. We’re going to have Conor on a second episode towards the end of this year to talk more about the book. But Conor, do you want to just give a brief sneak peek into what the book is about? Conor Richardson: Absolutely. So Millennial Money Makeover is a book that presents the case that anyone in their 20s and 30s can turn around their finances. They can escape debt, they can save for the future, and they can live the rich life now. I’m really excited about this book because it’s absolutely jam-packed with key information for people in their 20s and 30s. Our readers are going to hear from professors, entrepreneurs, industry experts, behavioral researchers, and it’s all to mint the momentum and turn the tide for our generation. It’s a fantastic read. I’ve gotten great responses early on for early reads. And as you mentioned Tim, it’ll be available for release in January of 2019. But if you want to pre-order, absolutely do it. Tim Mullooly: Awesome. And like I said, we’re going to have Conor back on towards the end of this year to talk more in depth about the book. But if you’ve liked what you heard so far, definitely go pre-order a copy today. So Conor, writing a book is no easy task. What would you say has been the most rewarding part about writing this book for you? Conor Richardson: Well honestly, the whole process has been incredibly rewarding. It’s a novel process to me. It’s my first book. And if I had to pick one element though, I think interviewing everybody in the book has been an absolutely exceptional experience. And learning people’s stories, how they got their start, how they turned around their finances, discussing research with the researchers who actually did it was absolutely thrilling. So I think the whole learning process unto itself has been phenomenal. Tim Mullooly: That’s awesome. I know I’m looking forward to picking up a copy and reading it when it comes out. So congratulations on the book. I’m definitely looking forward to it. Tim Mullooly: So we’re going to wrap up with a couple questions that we like to ask all of the guests that come on the podcast. First being, how would you define being wealthy? Conor Richardson: Wealthy is really not having to think about money as a first thought, or second thought, or maybe third thought in my life. And really what that means is having the ability to pursue your passions in life, because you’re financially free or you have a great financial foundation. Money is basically texture to your life story. I don’t think about money all the time, and I don’t think people should. But if you setup the proper structure, you have the proper savings in place, money is not going to be at the top of the mind for you, and it shouldn’t be. So living the rich life and being wealthy are sort of a cohesive thing for me. And that really means pursuing what you’re interested in, in life, and I think everybody has a calling. And it’s being able to pursue that relentlessly, and not think about money during the process. Tim Mullooly: Right. And you said before, a lot of millennials are stressed about money. So hopefully throughout their life, they become less stressed about it, like you’re saying, and not have that financial worry being at the top of their mind, and they can just actually enjoy life and what they’re doing. What would you say throughout your entire career, is the most important piece of advice that you’ve gotten? Conor Richardson: So my old boss, he gave me this little adage that has stuck with me. And it’s, “Learning at the rate of experience is too slow.” And really what that means is that you don’t necessarily have to wallow through the drudgery of self-experience in everything that you do. But you can find someone who maybe has already done something that you want to do, and contact them, and try to start a conversation with them. Ask them how they got there. Get some tactical advice about how they started their career and what they’ve done right. You can observe them and work hard. So I think there’s a tremendous amount of information to be learned from other people. And that’s kind of what I try to do in the Millennial Money Makeover book, is really just distill things down for people so they don’t necessarily have to go do all this research. But it’s in one easy to read location. Tim Mullooly: And I feel like that advice bridges over any kind of industry. And just going out and learning from people regardless of what you’re doing is always a good way to further your career and get better experience. So we’ve got one more question for you here, Conor. Outside of work, we’ve talked a lot about your book, and the website, and what you do for a living. So outside of work, what’s one thing in life that you’re most passionate about? Conor Richardson: Well for me, it’s my family. So when I’m not writing, or working, I’m spending time with my amazing wife and our hilarious little vibrant 2 1/2 year old son. So I try to spend as much time as I can with them. And that’s the rich life right there. So I spend as much time as I can with them. Tim Mullooly: That’s awesome. That’s going to wrap up this episode. Conor, thank you so much for coming on the podcast. I really appreciate you taking the time. Conor Richardson: Tim, I appreciate it. Thank you very much. Tim Mullooly: If you’re listening to this on iTunes, please subscribe to the podcast to get new episodes every week. And feel free to leave us a review or a comment, because it would really mean a lot to us. Be sure to follow us on Twitter and Instagram at LWM_Podcast for more news and updates about the show. Again, for anyone listening out there, we’re going to link to a bunch of things in the show notes, millennialmoneymakeover.com. We’ll also link to the Amazon page as well, for the book, where you can pre-order that. Like we said, it’s coming out in January of 2019. But if you enjoyed this episode, go pre-order a copy of the book now. We’ll link to all of that in the show notes. So thanks for listening to this episode of Living With Money, and we’ll see you on the next one.